Wen LePore has been interested in art since she was a child. Both of her parents were artists – her dad was a musician and her mom an actress. She received formal artistic training from her father in music. In college, she studied mathematics, and then became a math teacher for years when she was in China. Her dream, however, always was to be an artist. In 2008, she had a chance to start her formal art education at Northern Virginia Community College. She finished her drawing and painting class there with professor Sherry Trachtman and continued to study ceramics with professor William Schran. She thinks all the art forms are the same whether painting, sculpture, music, dance, literature.... The difference is they are using different art languages to describe people’s feeling in order to explain their emotions. She researched many famous master painters, such as Paul Cezanne, Paul Gauguin, Vincent Van Gogh, Juan Gris, Philipp Otto Runge, Jacques-Louis David, Titian, and Gustave Moreau. Subsequently, Sam Houston State University professor Dr. Enrique Mallen helped her research Pablo Picasso. Landscape , abstract art is her favorite. Painting portraits is very challenging. She found as she looked at the details of plants or other natural forms, there are many abstract or geometric patterns and shapes. She tries to merge abstract shapes in natural landscape paintings or even portraits. Abstract artwork is not as easy as many people think. She thinks creating a great abstract artwork is the most difficult job for a painter. That’s why abstract art is always full of attraction. Most of the time she likes to paint plein air. She paints what she feels is beautiful. Sometime she will paint to music in her studio. She can feel colors by the notes of the music. The exciting part is that different music can help her create strong energy into different brush strokes. Only with a strong base can a building reach high levels. Since Dec 14, 2014 she started to take special drawing and painting workshops with Dan Thomson in the Art League School. She has taken more professional drawing classes and painting workshops with Robert Liberace at the Art League School in the old town Alexandria, Virginia since 2015. Wen is member of Arlington Artists Alliance since 2010 and member of The Art League since Sep 3, 2012. *Amelia T. Clemente Family Award -- The Best in the show for “The Moment” -- The Art League Open Exhibit in May 2017, the Juror was Dana Shearin. * Honorable mention for “The Wheat Field” -- “The Power of Nature” Juried Show in 2018. The exhibit was sponsored by Arlington Artists Alliance, the Juror was legendary DC artist Lilian Thomas Burwell. *Honorable mention for “Final Countdown For Birding” -- The Art League Habits Exhibit in January 2017, the Juror was Rebecca Chaperon. *Honorable mention for “Portrait of Len Bracken ” -- The Art League All-Media Membership Exhibit in January 2015, the Juror was Paul Reuther. * Honorable mention for “Happy Field” -- “Think Like a Child” Juried Show in 2012. The exhibit was sponsored by Arlington Artists Alliance, and the juror was Lisa Semerad. * One of ten equal awards for “Tree View and City” -- Student Fine Art Show in 2010. The show was sponsored by Department of Fine Art NVCC, the Judge was Dr. Susan LaMont Weissman. 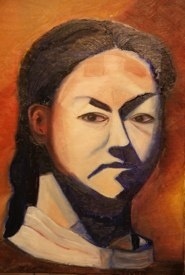 * One of ten equal awards for “Portrait of Wen” -- Student Fine Art Show in 2009. The show was sponsored by Department of Fine Art NVCC, the Judge was Dr. Susan LaMont Weissman. Wen Joined many group shows from 2009 to the present. She also had some small solo shows around different Arlington Artists Alliance venues. Wen is preparing her solo exhibit “Human & Nature”. The solo exhibit is on its way. The Dancing Tree II oil on canvas 24" x 30"
Blue Vase oil on board 11" x 14"
Mountain Laura Blossom at Monticello Paark oil on canvas 24" x 30"
Anne oil on canvas 24" x 30"
The Color of the Season oil on canvas 24" x 30"
My Love oil on canvas 18" x 24"
Aged Tree oil on board 11" x 14"
The Priest oil on canvas 20" x 24"